Every sachet of X2O contains calcium, magnesium, and over 70 trace minerals. These essential minerals & electrolytes become ionic in water allowing them to be absorbed quickly and easily by your body. X2O delivers three main benefits: increasing the alkalinity (pH) of your water, optimizing hydration, and revitalizing your body with 70+ essential trace minerals. 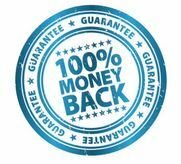 This simple and amazingly affordable product naturally transforms your water to help you create a positive transformation in your daily health. Plain water is dead. Bring your water back to life with X2O! ​Hydrate: X2O Sachets actually make water "wetter" by physically changing the molecular structure. This dramatically improves your body's hydration at the cellular level. Recommended...Best results when you ​use two sachets per day! One X2O Sachet per two bottles of water. Do not tear open the X2O sachet. 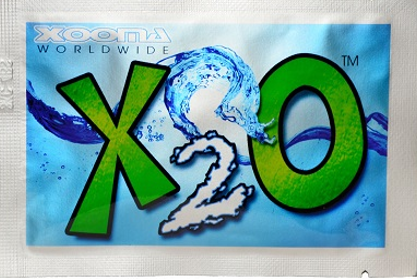 ​Always remove an old X2O sachet before putting in a new one. 1. 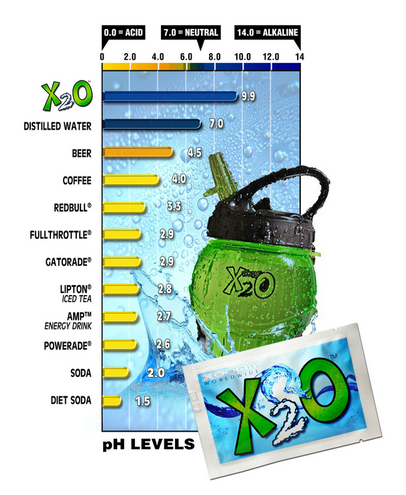 X2O helps to hydrate your body at the cellular level. 2. X2O provides essential trace minerals & electrolytes your body needs each day. 3. X2O gives your body a healthy alkaline boost to fight against poor diet & modern day stress. Your body is designed to be approx. 70% water. The most critical fluid in your body, your blood, is mostly water. Your muscles, skin, and vital organs all contain and need large amounts of water for optimal health. Water also transports oxygen to your cells, delivers nutrients, removes waste, and provides energy to the body. Your body loses approx. 2.5 liters of water every day just through normal bodily functions. You lose water through urination, respiration, and perspiration. When you are physically active or athletic, you lose even more water. Although “thirst” is an obvious sign of dehydration, the TRUTH is your body is in need of water long before you feel thirsty. Symptoms of mild dehydration include chronic pains in joints and muscles, lower back pain, headaches, and constipation. A strong odor to your urine, along with a yellow or amber color indicates that you are not getting enough water. Why drink just plain water when you can “supercharge” your water? 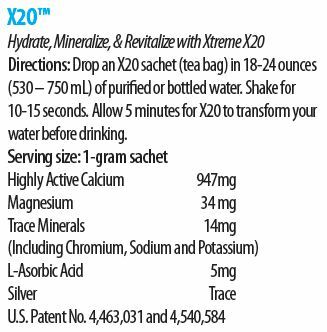 Just one sachet of Xtreme X2O adds vital minerals and electrolytes to your water while it helps hydrate you at the cellular level and provide a boost of alkalinity to your body. In fact, Xtreme X2O is powerful enough to transform standard tap water into a much healthier form of water. 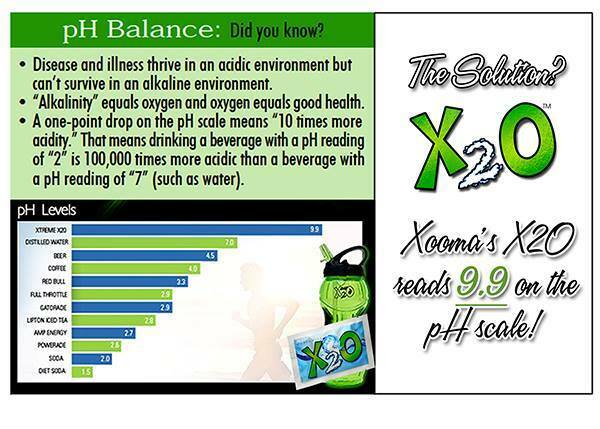 Xtreme X2O is 9.9 on pH Scale! Some of the symptoms associated with acidic conditions in the body include weight gain, insomnia, water retention, arthritis, migraine headaches, constipation, colds, flu, stomach ulcers, acid reflux and even cancer. Many health experts agree that an overly acidic body greatly diminishes the effectiveness of your immune system and usually leads to disease. Acidic conditions in the body are caused by: junk food, proteins, carbohydrates, fats, sodas, coffee, sports drinks, alcohol, environmental toxins, and stress. 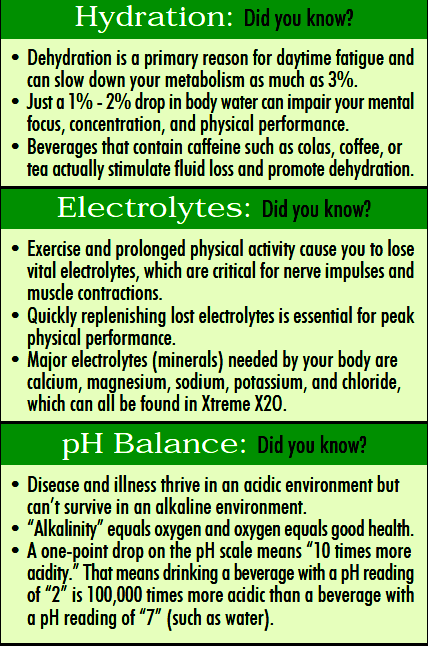 Considering this long list of items that can lead to acidic challenges in our body, it becomes very clear why it is so important to drink an alkaline beverage like Xtreme X2O every day. In order for the body to maintain optimal health, it needs to manage a very narrow pH range (slightly alkaline) - especially in the blood. In fact, the body will go to almost any length necessary to maintain your blood pH at 7.34 – 7.45 because anything outside that pH range could result in death. The process of restoring pH balance in your body always includes proper diet and nutrition. This means eating alkalizing foods (vegetables, low sugar fruits, etc.) and getting proper nutritional supplementation. However, the foundation of healthy pH balance is in drinking plenty of alkaline water. And the easiest way to “supercharge” the alkalinity of your water is by adding an Xtreme X2O sachet! 1. 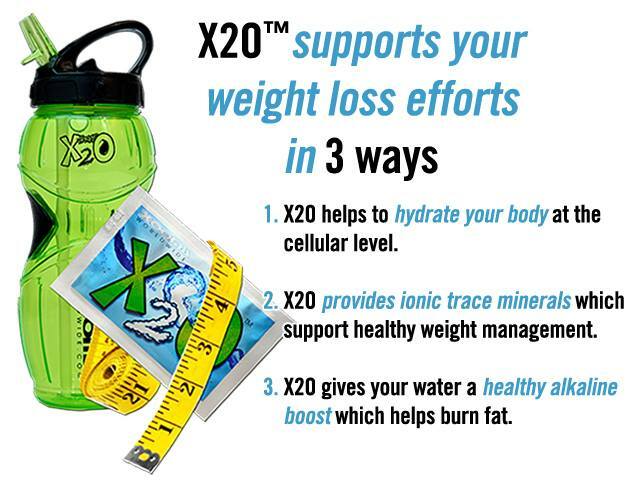 X2O helps to hydrate your body at the cellular level. Think about it. You’ve probably never seen a weight loss system or diet program that didn’t recommend that you drink more water. Why? Because your body needs to be properly hydrated in order for you to be successful in your weight loss goals. The problem is that most tap water and bottled water is not effective for optimal hydration. But, when you add just one sachet of X2O to that water, it provides improved hydration by allowing the water to be more easily absorbed by your body. In addition, X2O delivers vital electrolytes into your water that improve your overall hydration at the cellular level. Minerals have a direct effect on appetite control, blood sugar balance, food cravings, adrenal and thyroid hormone functions, and the use of fat for energy in your body. X2O sachets contain an all-natural mineral complex that releases beneficial trace minerals into the water which can be easily absorbed and used to support your body’s metabolic functions. 3. 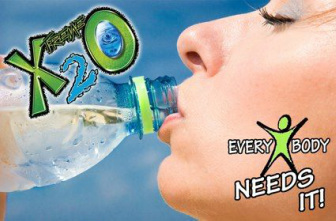 X2O gives your water a healthy alkaline boost which helps burn fat. If you want to shed excess body fat with less effort it is important to maintain a healthy pH balance in the body. This is the “hidden secret” to continual fat loss that keeps most people from getting the results they desire. Xtreme X2O...at work within 30 minutes. Alkalizing, Anti-Aging, Anti-Oxidant, Electrolytes, Hydration, Absorption, and Disease Prevention are all words that can be attributed to an X2O sachet added to your water. Essential minerals from the X2O sachet are released as ions into your water, allowing them to be absorbed quickly and easily at the cellular level. X2O transforms plain water into a powerful alkaline beverage which can help fight against acidic and unhealthy conditions in the body caused by today's fast paced lifestyle and is the perfect addition to any supplement program. Suggested Use: 2 per day - (1) X2O sachet per (2 to 3) 18-24 ounces bottles of water. Always discard old X2O sachet. 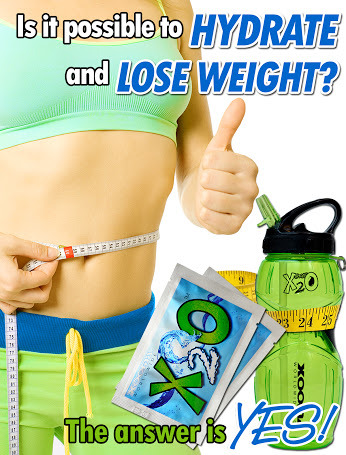 Drop an X2O sachet in 18-24 ounces of purified or bottled water. Shake for 10-15 seconds. 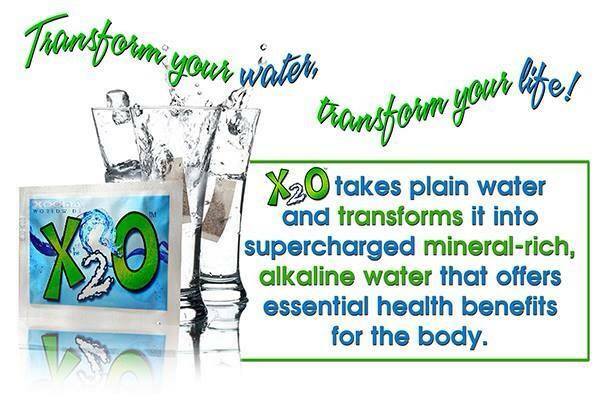 Allow 5 minutes for X2O to transform your water before drinking. Optimal hydration equals Your Body Weight divided by 2 = ounces of water to drink per day (Your Weight is 200 lbs then your goal would be to drink 100 ounces). If you are not drinking much water, work your way up to drinking half your weight in ounces in water. No Odor, No Taste, and No Sugar...Just Minerals! Xtreme X2O is available in 60+ countries! Best results when you use 2 sachets per day! 1 X2O sachet per ​2 (18-24 oz) bottles of water. Grab an X2O Bottle for $3.99 at Checkout!